RoRo vessel Salome has left Zhoushan, China after being repainted in Wallenius Wilhelmsen’s new brand colours. Having recently called at Baltimore, USA, she is now making her way around the world. 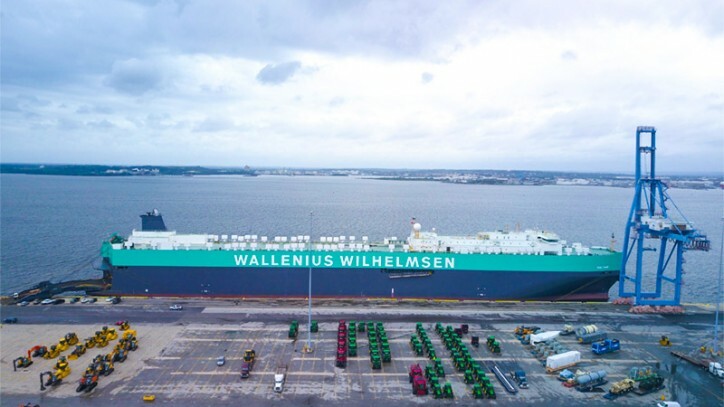 The vehicle carrier, built in 2012, is one of the first vessels to have been rebranded with WW Ocean’s sea-green and flint-grey. At 75,251 gross tonnage and 43,878 deadweight, Salome can transport up to 6,000 cars at a time. While in Baltimore, Salome used her 505 tonne stern ramp and nine internal cargo decks to discharge and load nearly 7,500 tonnes of rolling and static cargo during a 24-hour port stay. She is the first of the WW Ocean fleet to be repainted in the new colours as part of scheduled maintenance work to avoid extra costs. 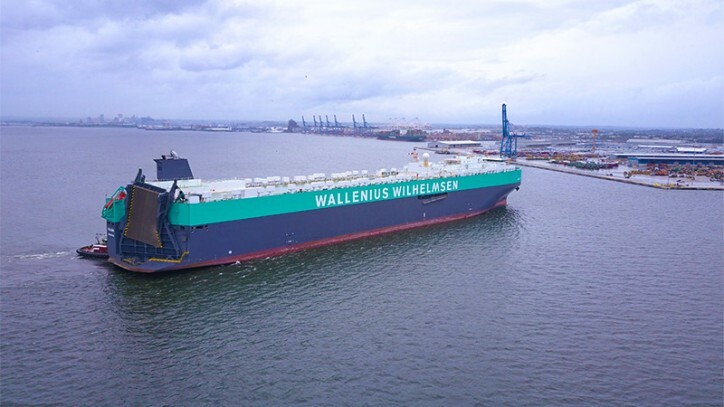 Salome’s repainting follows the creation and listing of Wallenius Wilhelmsen in April 2017’s rebrand, when Wallenius of Sweden and Wilhelmsen of Norway merged their jointly-owned companies. 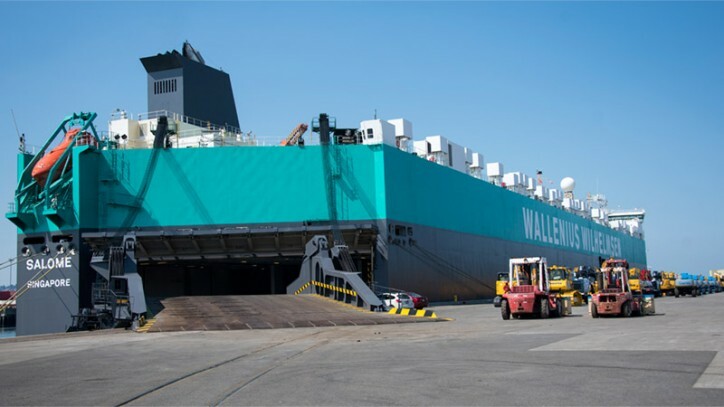 Former operating entity Wallenius Wilhelmsen Logistics (WWL) was restructured to become two new entities: ocean shipping company Wallenius Wilhelmsen Ocean (WW Ocean), and land-based logistics provider Wallenius Wilhelmsen Solutions (WW Solutions). 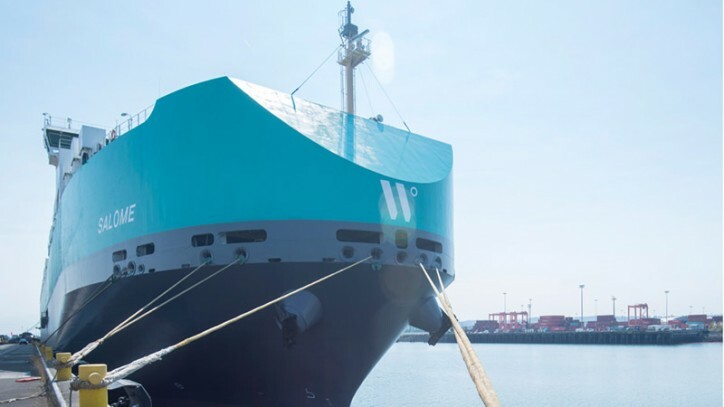 The group’s rebrand also saw the launch of a new Wallenius Wilhelmsen logo – a modern take on the traditional W, made up of two lines and a circle. The lines symbolise the products transported on the company’s RoRo vessels, and its land-based logistics services. The circle represents navigation degrees, the ‘O’ of ocean, as well as the life-cycle perspective. The sea-foam green symbolises the ocean, while the grey symbolises land.